L-com, a preferred manufacturer of wired and wireless connectivity products, announced today that it has launched a new line of LC internal shutter couplers that are ideal for today’s high-speed networking environments where cleanliness is a requirement for performance. L-com’s new LC internal shutter couplers feature an internal automatic shutter that protects the adapter’s interior against dust and contaminants. The shutter automatically retracts or opens with the insertion or removal of LC connectors. These compact, space saving couplers are designed for mounting in panels with rectangular cutouts and come with or without flange-mounted-style ears. They use the same panel cutout as a duplex SC coupler while providing twice as many ports. “Our new LC couplers deliver a compact design along with the convenience of a 100% automatic dust shutter that keeps the interior clean from dust and contaminants without any physical handling of the shutter door,“ said Dustin Guttadauro, Product Manager. These adapters allow for visible light to be seen through the adapter, which is ideal when trying to trace signal via a light source. They feature ZR alignment sleeves which provide precision mating for both multimode and single-mode applications. 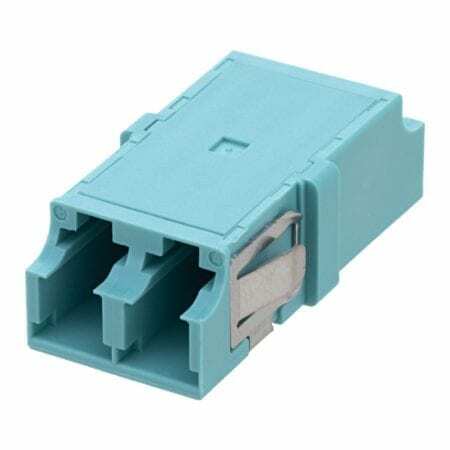 These couplers are available in both duplex and quad versions and are compatible with standard LC connectors. They are offered in four colors to match the fiber mode being used. L-com’s new LC couplers with dustproof shutters are in stock and available for immediate shipment.